We have gained expertise in offering supreme quality Multicolor Rustic Slate to the esteemed customers. Slates are very commonly used under application such as wall clading , footpaths due to its property. 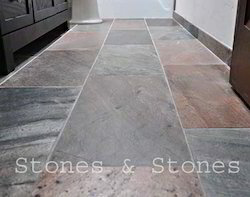 India Slate stone are famous for beauty , vibrant colors. India Slate stone are mainly quarried near Delhi , Bhilwara , Andhra Pradesh. The slates are available in different colors and dimensions. India Slate stone also takes polish. 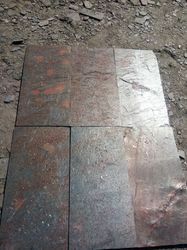 Being a client centric organization, we have been able to offer a wide range of Copper Slate. These are widely demanded by various clients, owing to unique textures and clean finish. Our products find their wide application in various construction industries as these are suitable to add an extra ambience to surroundings. We are the leading quartzite Exporter in India, one of them is copper red slate from India, producing Exporting copper red quartzite slabs, copper red quartzite tiles & cut-to-size. Largest Natural Stone Exporter in India, exports slate slabs and slate Tiles. Reddish brown with silver flecks and natural cleft, calibrated and smooth finish.Excellent choice for interiors and exteriors. - One surface natural & one surface calibrated. - One surface calibrated and one surface polished / honed .